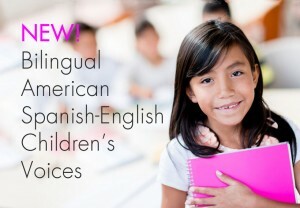 Acapela Group & AssistiveWare are proud to unveil the first ever genuine, natural-sounding bilingual American Spanish-English children’s Text to Speech voices . Meet Valeria & Emilio. The new bilingual children’s voices are designed for Spanish and English speaking children in Latin America and the USA, including the estimated 110 to 130 thousand bilingual Spanish-English children in the United States who cannot rely on their natural speech to meet their daily communication needs. For the first time, not only will they be able to speak with a Text to Speech voice that matches there age but also use the exact same voice when speaking Spanish and English. The new Spanish-English children voices, Emilio and Valeria, were recorded by and for children. Co-developed by Acapela Group, AssistiveWare, and Tobii Technology, these bilingual voices are now available in AssistiveWare’s Proloquo4Text 1.1 text-based communication iOS app that gives a voice to people who cannot speak, AssistiveWare’s Pictello 2.1 visual story-telling iOS app, and in Infovox iVox 4 for Mac. With Infovox iVox, these new voices can be used with any Mac app that supports Text to Speech. For videos that include a behind the scenes look at how children’s voices are made, how text-to-speech works, some short interviews, and the impact these voices have had, follow the link. Founded in 2000, AssistiveWare has established itself as the worldwide leader in innovative assistive technology software for iOS and Mac OS X. AssistiveWare works in close collaboration with end users and professionals to offer a portfolio of award-winning solutions for individuals with physical, vision, communication, and reading impairments. In 2002, AssistiveWare was the first company to deliver universal access to Mac OS X with the KeyStrokes on-screen keyboard. Always innovating, AssistiveWare was also the first company to release a full-featured Augmentative and Alternative Communication solution for iPad, iPhone and iPod touch – the award-winning app, Proloquo2Go. Recently AssistiveWare released Proloquo4Text, a text-based communication app for iOS. Acapela Group invents speech solutions that bring content to life through giving it a voice in up to 30 languages. More than 100 resounding synthetic, yet natural sounding voices as well as new, authentic American and British children’s voices are ready to vocalize written content into a pleasant audio result. Acapela Group’s repertoire includes producing a wide-ranging library of voices including voices that have: accents or specific dialect attributes, singing or storytelling ability, different moods and emphasis, voices for all ages and all languages and recognizable characters or celebrities. Each audio selection is authentic sounding, unique and original, presenting a distinct personality that perfectly matches different contexts. More than just simple vocalization of texts, Acapela Group aims to add a subtle layer of intelligence and significantly enrich audio dimension by offering more meaning and intent to each voice.